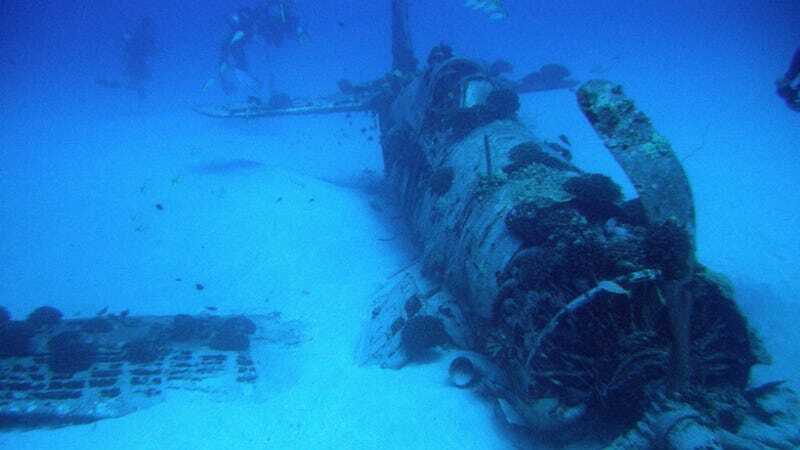 Deep below the Pacific Ocean, dozens of WWII pilots are lying in watery graves, still inside the aircraft took them across the sky decades ago. It's far too late for a rescue, but as Popular Science explains, the people behind the BentProp Project—and their undersea drones—are surfacing these soldiers' incredible history. Last year, local spear fishermen diving on Palau’s western barrier reef stumbled across one of the most impressive finds: an intact plane. They alerted the owner of a dive shop, who passed photos of the wreck along to BentProp. Scannon’s team eventually identified the plane as an American Corsair. When [they] reach the Corsair, engineers lower the [autonomous underwater vehicle], now equipped with GoPro HERO3 HD cameras, into the water, and it once again begins a methodical sweep. Back in California, [the team] will use the thousands of captured images, plus hundreds of photos taken by human divers, to build a 3-D reconstruction of the plane.